Everyone’s asking the question, “Will Google’s removing side ads impact marketer’s organic results? According to inbound marketing leader HubSpot, it will. However, they’re still guessing how devastating the change will be. Clearly, placing an extra ad above search results increases the odds an ad is going to take the click rather than an organic result. The real issue is how Google perceives the search term. For some search results, there will be little difference. For example, searches for a business type has been triggering a map and list of local results for years. That’s essentially the same. The loss of side ads won’t have as much impact here. However, some pages may not see any organic results at all, due to the map and the business list. If you aren’t on the list, it could hurt you. In contrast, major changes for keyword searches for popular purchases such as used cars, car insurance, laptops, computers, etc. are already showing up. Topic searches also display increased competition from advertisers. These typical searches trigger Google’s buying signal. If Google has the advertisers for the topic/keyword, Google is placing four instead of the one to three ads it used to place above it’s search results. Many find this disturbing because even the larger desktop screens have ads filling the space above the fold. It suggests the decision is driven by financial concerns, not the best interest in the person searching for solutions. 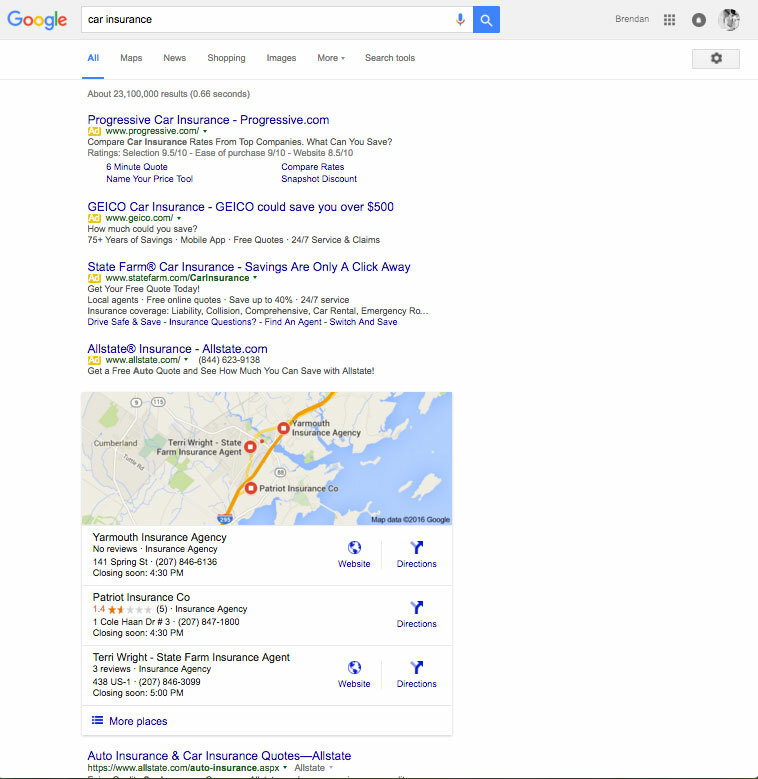 An additional concern is the way in which Google’s ads display a more search result-like appearance. Will people be smart enough to bypass these ads in preference to organic search results? It’s a question only time will tell. Some SEO experts studying the issue suggest Google’s move in this direction is something people will adjust to quickly. They’ll begin to recognize that most of the content above the fold is advertising. As long as Google’s still serving up 10 organic results per page, like it always has, savvy users will develop the habit of scrolling past the advertisements. They may even start considering second page results more frequently. This also is conjecture. We’ll see whether this trend plays out over the next several months. It appears the organic search types that will be hit the hardest are verticals where Google has its own competing products. Travel (hotel and flight searches), insurance, shopping, etc. have seen drops in organic visibility. The only two areas not hit hard are searches that trigger Knowledge Graph results and Product Listing ads. Julie Logan states, “With the rise of adblockers, whatever anybody is doing with their ads can potentially become irrelevant. She suggests your best response for organic results is to stay on the cutting edge as interactive and visually attractive options open up. Sam Silverwood-Cope recommends pushing organic and taking a lower position in PPC. This could even result in a bottom ad placement and a first place organic position. Kevin Gibbons advice complements this. He says you should focus on attaining a first three organic search position, “otherwise there’s likely to be a big drop-off in clickthrough rates. Graham Charlton of ClickZ.com believes organic SEO is going to get even more difficult for the most competitive terms. This will make long tail search more important. It also means focusing on your branding is going to prove more important. When people search by brand, rather than product type, it’s easier to rank high in a shrinking organic search real estate. 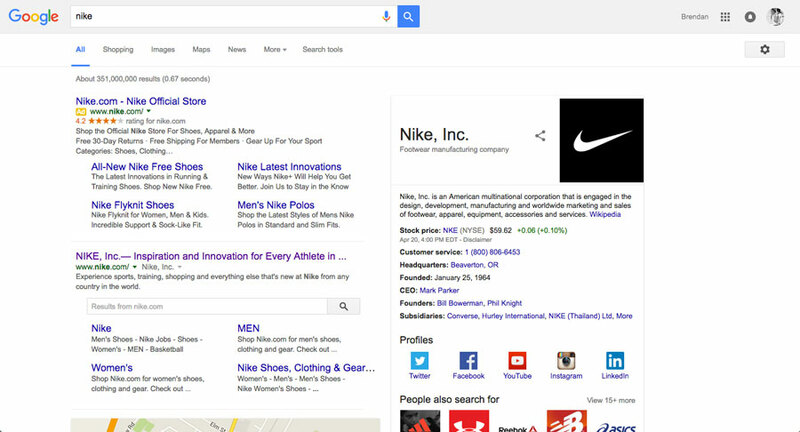 As you can see by our example search, "Nike", Nike dominates above the fold and clearly is firing on all cylinders. Alex Flores of Global Strategy Group says, “If you’re running paid search, or rely upon organic search to drive your business, generate leads, or manage your online reputation, you need to revisit strategy and approach now. He recommends that you “take a sampling of the most important keywords to find out how the metrics have been impacted. Revisit the strategy to either uncover new opportunities this change has created, or to recapture lost ground caused by this shift. If you have been using AdWords advertising as well as organic SEO, now is a good time to analyze what’s going on with your AdWords campaigns as well. Both organic search and ad results are in a state of flux. Most experts predict steeper competition for the first four spots in ad placement and a continuing trend away from the prominence of organic search results. Trying to get the public to realize what’s going on will be as difficult as trying to storm a citadel on a hill. It’s going to be our job to develop strategies that strengthen our position. It is advertising after all that keeps the Google search engine fueled. Be sure to download our free eBook: Getting Started with Content Marketing to stay competitive for the predictied increase in competition.